NOTE: This tutorial will go after the step of making the payment of time in our Arcbot chat. 2. Look on homepage of your panel for "Add time to bot" Click for example. 3. Check if the hours of time you have paid have been updated in the "Amount(Hours)".. 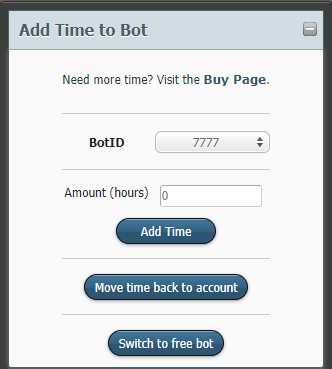 If the number of hours is at zero after making the payment on Arcbot xat, please restart (F5) the panel page. If the problem persists contact one of the active staff in the chat. 5. Wait a few minutes until the bot adds time. In this process, the bot is likely to restart.